Gov. 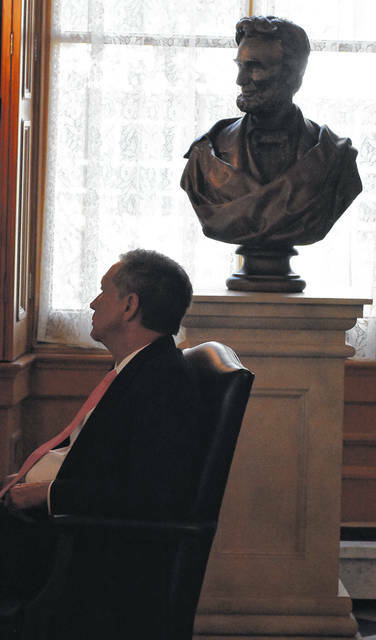 John Kasich answers questions in his office with a bust of Abraham Lincoln in the background in the governor’s office. Gov. 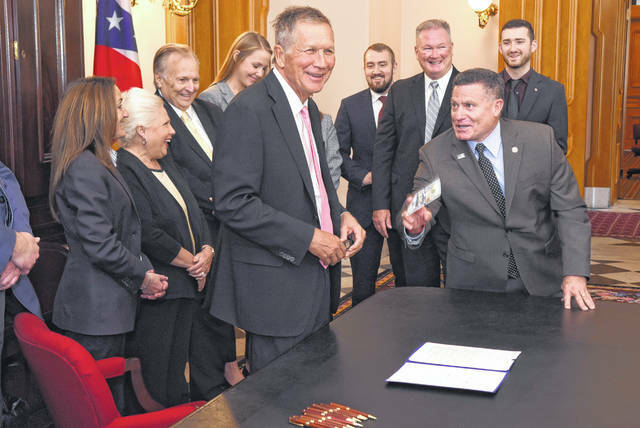 John Kasich laughs after examining a fake $100 bill brought to him by state Rep. Rick Perales before signing a law cracking down on counterfeiting. Gov. John Kasich answers questions from a gallery of residents during a bill signing at his office. Gov. John Kasich said he won’t be boxed in by the national Republican party. “I have a right to stake out what it means to be a conservative and thus, I guess, a Republican,” he said. Ohio Gov. John Kasich answers questions in his office in Columbus in October. “I’m not running for anything, at least not at this point,” he said about suggestions he might make another run for president in 2020. Gov. 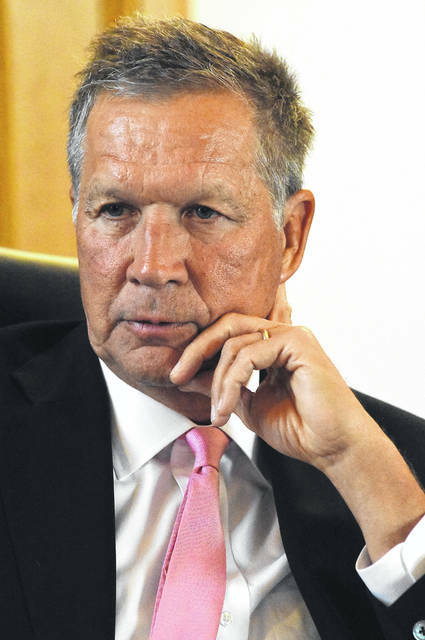 John Kasich defended his cuts to the local government funds. “Look, I’m for local government, but don’t try to bully me,” Kasich said. Gov. 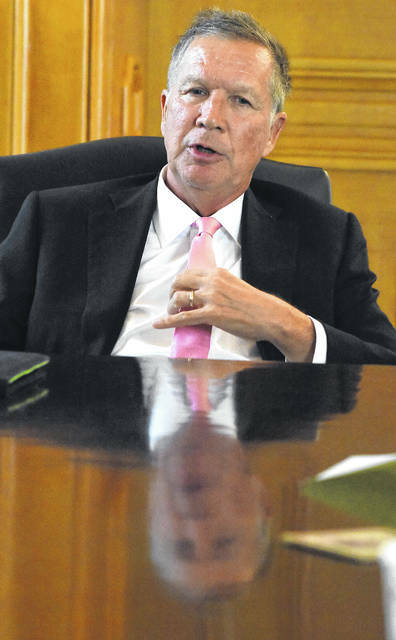 John Kasich considers the opportunities for Lima to be endless. “Can we look at Lima as sort of a gateway to the rest of the country? Can we think of it that way? Multimodal, do we think about trains and trucks? Do we do that?” Kasich said. See more photos from The Lima News’ editorial board’s visit with Gov. John Kasich. COLUMBUS — John Kasich is toying with his future. The two-term Ohio governor is acutely aware his current gig ends at the end of the year. He had a failed presidential campaign two years ago. He remains an outspoken critic of President Donald Trump. He’s a go-to for national media, a Republican governor who doesn’t like the president’s tactics. “I’m not running for anything, at least not at this point,” he said, with a glint in his eye during a recent discussion in his office with The Lima News’ editorial board. What can be determined is Kasich will leave office with the state carrying nearly $3 billion in its rainy day fund, nearly 600,000 jobs created in eight years and a politician who frequently frustrated even members of his own party. Keith Faber got his first insight on Kasich, a former congressman and Fox News personality, during an event in Lima on the deck of Matt Huffman’s law office prior to the gubernatorial primary. Faber, who voters chose as the next state auditor last week, was stunned by the ambition of it all. “At the time, I said, ‘Congressman, if you do all of that, in two years they’ll burn you in effigy. In the next two years, they’ll try to make you king,’” Faber recalled. 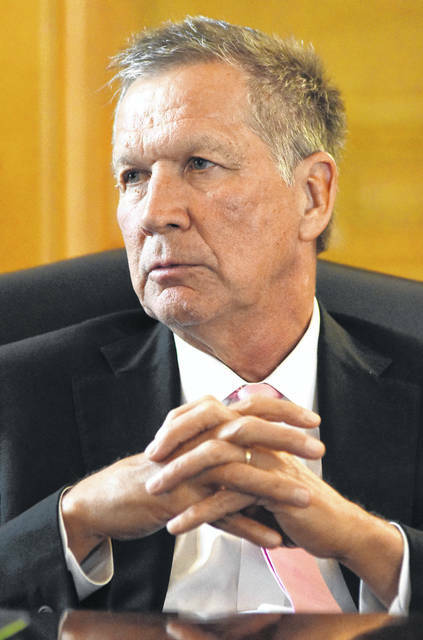 When Kasich took office, the state’s rainy day fund was down to 89 cents. He also addressed a budget that was unbalanced by $7.7 billion, said Timothy Keen, director of the Ohio Office of Budget and Management. Yes, Kasich balanced the budget. He also made plenty of enemies along the way. Local entities, from schools to cities to townships, were exasperated by cuts to local government funds in Kasich’s first budget. They were just as frustrated when that money, which accounted for 3 to 5 percent of most entities’ budgets, wasn’t returned to them in full once the financial crunch ended. “Look, I’m for local government, but don’t try to bully me,” Kasich said. The rainy day fund now nears $3 billion. That amounts to about 8 percent of the state’s budget. State Sen. Matt Huffman, R-Lima, was the majority leader of the state House when Kasich delivered the State of the State speech in Lima in February 2013. Just before a formal procession into the room, Huffman was standing right in front of Kasich, ready to walk into the room. “He leans up and starts busting my chops about some piece of legislation,” Huffman said. “I don’t even recall what it was, but there was something I didn’t do right. It was, ‘You guys need to start moving this along,’ basically this chastising you for not doing your job better kind of thing. A stunned Kasich hadn’t realized his overstep. That anecdote speaks volumes about Kasich’s government style. He offered this advice to the next governor, Mike DeWine. 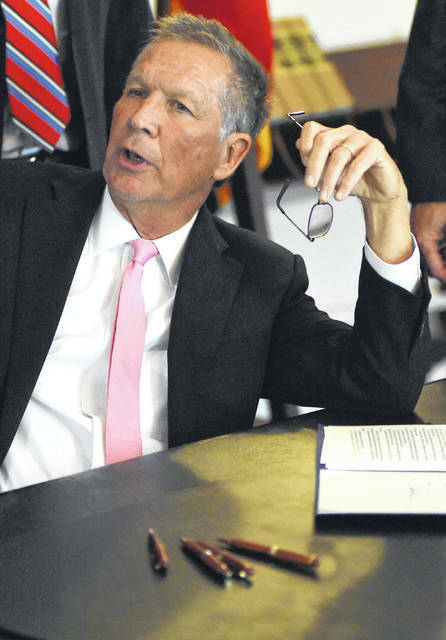 Kasich charmed a crowd during a bill-signing one day in October in his office. He had the crowd laughing as he examined a counterfeit $100 bill. He appeared comfortable and easygoing. An hour later, he peppered questions on his guests from Lima, offering unsolicited advice on making the region grow, clearly in command of the room. “Can we look at Lima as sort of a gateway to the rest of the country? Can we think of it that way? Multimodal, do we think about trains and trucks? Do we do that?” Kasich said. That’s how he operated with legislators too. One major innovation of the Kasich administration was JobsOhio. The public/private partnership overhauled how the state tried to attract jobs. “They need to be creative. 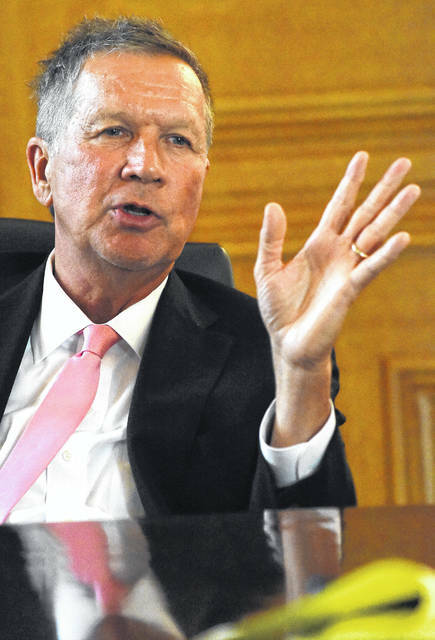 The whole key is to be creative and figure out what the assets are of a particular community,” Kasich said. He said the program’s been a benefit, making Ohio the No. 1 state in the Midwest in terms of job growth since 2011 and seventh in the nation, 39 percent higher than the national average. Still, the state isn’t keeping up when it comes to training the workforce, he said. Kasich wasn’t an enemy of education though, said Jim Lynch, Kasich’s communications director. Kasich, a media darling for his straight-forward criticisms of President Trump’s demeanor, says has a “great” relationship with the Republican party. “The continual criticism has been a disservice to the rest of us as Republicans and what we were trying to accomplish, not just nationally but here locally,” Huffman said. Faber was disappointed Kasich decided against attending the Republican national convention, which was held in the state in Cleveland. “His constant conflict with the president has caused problems within the party,” Faber said. Kasich doesn’t sound like a man ready to be silenced for the good of his party, though. Kasich said he’s “not a guy who lives in the past.” Still, he acknowledges shortcomings over his eight years in office. One was the failed Senate Bill 5 referendum, which would’ve limited collective bargaining for state employees. Many saw that as an attack on unions. He takes great pride in his decision to expand Medicaid in the state, using 98 percent of federal government money and 2 percent of Ohio’s money. “We’ve helped a lot of people, a lot of single moms with children who now can keep a job since they have the ability to get healthcare,” he said, noting most people get off Medicaid within 18 months. That decision isn’t so popular among his Republican colleagues. “Now we have to make sure the program is very efficient, or we can’t afford it in the future,” Faber said. Being popular was never Kasich’s goal, though. Reach David Trinko at 567-242-0467 or on Twitter @Lima_Trinko.